"An output plug cover that snaps in, blends in, and stays put until you remove it." "A straightforward way of keeping objects and baby's fingers from the danger of an electrical outlet." "For simple, easy access to outlets while still protecting your baby." "Add an additional level of protection to your outlet plug covers, choose a model with a locking mechanism." "A smooth plastic plate that fits over an existing outlet - concealing the socket beneath." "A simple child-proof solution that still gives easy access to outlets." "A good choice for a home with babies or toddlers." The best overall outlet cover is one that will keep your baby from accessing the socket, but still allows you to have easy access to the outlet. The Wappa Baby Outlet Covers do both and they're our top pick for the best outlet cover. These outlet plug covers are made of non-toxic ABS plastic, which has electrical insulation properties, and the white finish expertly conceals the holes of the socket (which are often a major draw for little fingers). They snap into place firmly and won't fall out or break. While no outlet cover is guaranteed to be resistant to your baby’s level of curiosity or determination, many parents comment that these outlet plug covers were the ones that finally solved their baby-proofing dilemma. Some families said that these outlet covers were hard to remove when they wanted to use the outlet, but they effectively keep out toddlers and babies. For an outlet plug cover that snaps in, blends in, and stays put until you remove it, this product is the way to go. For the simplest outlet plug covers, choose this set from Dreambaby. These clear plastic pieces are a straight-forward way of keeping objects and baby’s fingers from the danger of an electrical outlet. The molded plastic fits inside the outlet and prevents little fingers from touching anything dangerous. A few users said that the outlet covers were easier for their toddler to remove than other means of outlet protection. However, most people found the outlet covers to be sufficiently tight-fitting and it kept their baby from accessing the outlet. The 12-count pack will give you plenty of covers to protect outlets in your home, and to store a few in the diaper bag for use when visiting the homes of family and friends or for hotel stays. For a self-closing outlet cover that provides easy access to a power source but automatically keeps little fingers out, choose the Safety Baby Self-Closing Outlet Covers. These outlet covers will require a little more installation work since you’ll need to unscrew your existing outlet covers and screw these into place. While they do come with the necessary screws for installation, a few people note that purchasing your own screws at the hardware store may lead to a tighter fit since the included screws seem to be too short. After making the simple swap of outlet covers, these new plates keep electrical plugs sealed off unless you push it aside to insert a plug. Many people comment on how much easier it is to use an outlet without having to remove an individual plastic plug, and add that their child can’t figure out the process required to slide open the outlet cover, exposing the plug beneath. So for simple, easy access to outlets while still protecting your baby, choose the Safety Baby Self-Closing Outlet Covers. For a baby bent on pulling off outlet plug covers, the Deluxe Press Fit Outlet Plugs from Safety 1st are a great choice. While simple plastic plugs may work for some babies or toddlers, they can sometimes be easily removed by curious or persistent children. To add an additional level of protection to your outlet plug covers, choose a model with a locking mechanism like this set from Safety 1st. The Safety 1st Deluxe Press Fit Outlet Plugs require you to push a button on the left side, then continuously press a button on the top side of the plug cover. After squeezing both buttons (and while holding the top button down), the outlet cover can gently be pulled from the outlet. Some users complained about the difficulty of removing these covers, but many others praise them for the high-level of protection they provide. If you have a baby that has already figured out how to remove standard plastic outlet plugs, purchase these Deluxe Press Fit Outlet Plugs for more protection and peace of mind. If an electrical outlet keeps catching your baby’s eye, one of the best things you can do is to make it ‘disappear.’ The CoverPlug Electrical Outlet Cover is a smooth plastic plate that fits over an existing outlet – concealing the socket beneath. Installing the CoverPlug outlet shield is easy according to many parents. Simply press the posts on the back of the CoverPlug into the grounding holes in the top and bottom socket of the outlet. No other tools are needed, and the shield can be removed at any time if you need access to the outlet. 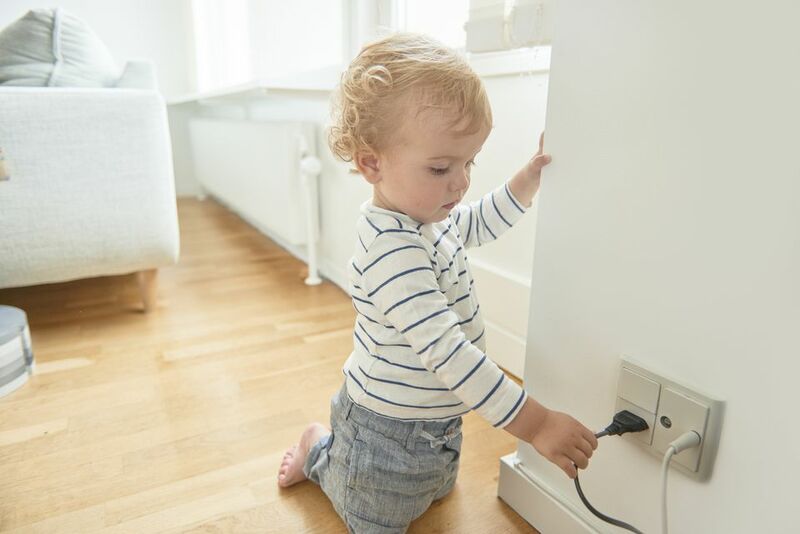 While a few users reported their child was able to tamper with the outlet shield, the vast majority said that their baby or toddler no longer even noticed the outlet once the CoverPlug was in place. To completely enclose outlets, even with cords plugged in, choose a box-style outlet cover like the one from LectraLock. This clear plastic outlet cover will allow you to leave things plugged in while ensuring that your child can’t pull out the cord, leaving the socket exposed. The box has a top and bottom button that must be pressed in order to open it. However, note that the box is best for accommodating standard outlet plugs. Larger charger plugs may not fit well inside the box. A box-style outlet cover is good for protecting sockets that power items that stay plugged in for an extended period, like a table lamp. It also is a handy solution for protecting outlets that you need regular access to, but don’t want to have to remove plugs from every time you use them. Many users comment that the box is a simple, child-proof solution that still gives easy access to outlets. If you don’t like the idea of fiddling with tabs or buttons to remove electrical plugs but still want something that is child-proof, choose the Balfer Electric Socket Protector Caps. These outlet plugs snap in like many other plastic plugs but require you to insert a plastic ‘key’ to remove the plug. Without the use of the key, the caps are difficult to remove from an outlet. This makes them a good choice for a home with babies or toddlers. But they also are useful if you find prying other plugs from the socket to be a pain, or you don’t like having to press and squeeze buttons or tabs. With the cap and key solution, just insert the plastic key to remove the plug. The set comes with four keys. Overall, users report that the plugs are very tight in the socket and difficult to remove without the key. However, if you were to lose all four keys, you could use another thin object to pry the cap from the outlet.